JONESBORO, Ark. — Hytrol hosted 20 high school students participating in El Centro Hispano’s Hispanic Emerging Leaders Program on January 9. HELP nurtures the development of leadership, responsibility, community involvement and communication skills in high school students. The program was created to guide and support Latino high school students in reaching important academic goals as well as planning for their futures. During their visit, Hytrol employees spoke about the conveyors Hytrol manufactures and on the various career opportunities in the material handling industry. The students also toured the production facility and manufactured a 3-foot E24™ conveyor. The program helps prepare Latino high school students to apply for college or embark on career paths by engaging with various leaders and mentors from around Jonesboro and the state of Arkansas. 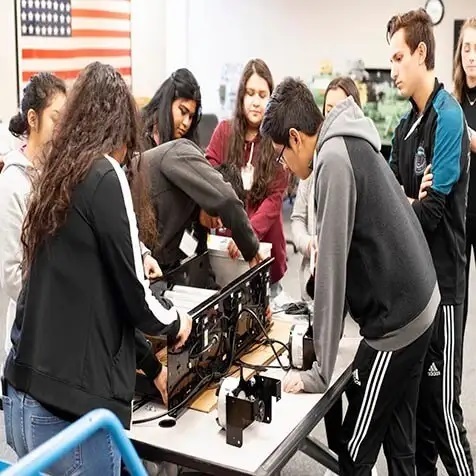 Students complete activities to build trust and teamwork while also learning about the roles of different local leaders in areas such as education, healthcare, business and manufacturing.